Everyone, adults and youth from 12 years on. When the cold of winter transforms the water to ice, blue lines of frozen waterfalls are created. 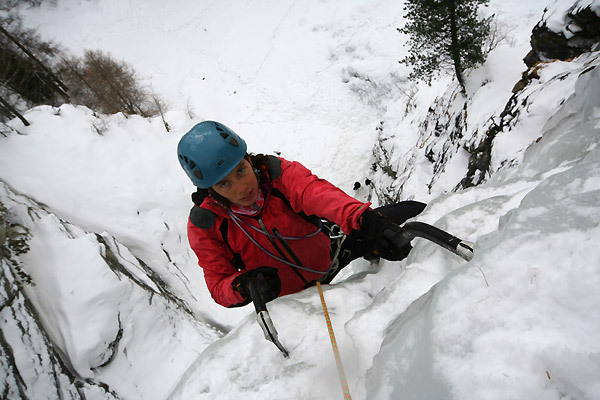 These icefalls can be climbed with a special technique, the so called “Piolet-traction”. This steep ice technique equals sport-climbing on rock. The activity, born at the end of the 80s, allows for climbing on ice in the month of winter and gives the chance to venture into a world of fragile crystals in a spectacular and unique setting. This is the universe of the ice. PFor the easier icefalls (like the Lillaz waterfall) no special skills or training is requested. For the more complex icefalls however (Patry waterfall, Lillaz Gully, Flash Estivo) , basic climbing skills, a solid knowledge of the handling of the equipment as well as a good physical preparation is highly recommended. Icefalls graded WI5, WI6 and higher are reserved for the experts, who are physically and mentally prepared to venture on hard ice, to test themselves at technical difficulties in an extraordinary environment. Mountaineering boots, harness, helmet, crampons (classical or ice), 2 technical ice axes, eventual ski sticks, skies or snowshoes for the approach (if necessary).